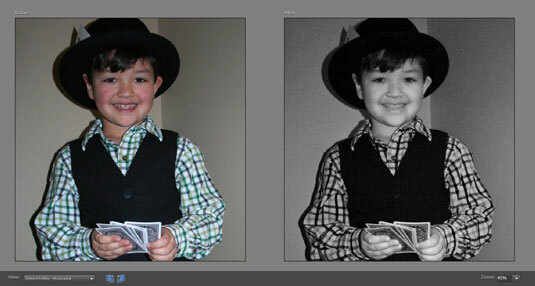 The Tools panel in Photoshop Elements 10 enables you to ad finishing touches to your images. Quick Photo Edit mode offers the Quick Selection tool for your selection tasks; with this tool, you can apply fixes to just selected portions of your image. Red Eye Removal tool. Try the Auto Red Eye Fix to remove red-eye from your peoples’ eyes. But if it doesn’t work, try using the Red Eye Removal tool. Whiten Teeth. This fix does what it says — it whitens teeth. Be sure to choose an appropriate brush size from the Brushes drop-down panel before whitening. Using a brush diameter that’s larger than the area of the teeth also whitens/brightens whatever else it touches — lips, chin, and so on. Click the teeth. Note that this tool makes a selection and whitens simultaneously. After your initial click, your selection option converts from New Selection to Add to Selection in the Options bar. If you pick up too much in your dental selection, click the Subtract from Selection option and click the area you want to eliminate. When you’re happy with the results of your whitening session, choose Select→Deselect or press Ctrl+D (Command+D on the Macintosh). Make Dull Skies Blue. Click or drag over areas of your sky that need brightening. Choosing a brush size and selection option is similar to using the Whiten Teeth fix, described in the preceding bullet. When you click your sky, it’s selected and brightened at the same time. When you’re done, choose Select→Deselect or press Ctrl+D (Command+D on the Macintosh). Black and White–High Contrast. This tool converts your image into a high-contrast grayscale image. The method and options are similar to those for the Whiten Teeth and Make Dull Skies Blue options. Here is a color image converted into a grayscale image that looks like a vintage newspaper photo.